Revive your old home stereo system with a simple plug in bluetooth receiver for the AUX port you never used in the past. If like me you have an old, but great quality home stereo system which you really want to use in conjunction with your mobile device such as a phone or tablet, then you are likely to need a bluetooth receiver. What does the AUX Port Bluetooth Receiver Do for You? Ok, so years ago we all bought great home stereo systems with a Tape Deck, CD player, Radio and (going back many more years) even a Spinning record player for the old vinyl records. These stereo systems were typically split into “separates” (connected to an amplifier at the rear with a lot of cables) or came as a fixed, all encompassing unit which had all the elements built in. Either way, whatever you ended up with more than likely has a port on the front or back called the AUX port (Auxiliary). Until fairly recently I didn’t even know what this was for – my own home stereo has an AUX position on a rotatable switch on the front which selects between the input devices (tape, radio, cd, or aux port). What this switch does is tell the amplifier to take its input from the device which is currently selected by this switch – so the switch is on the amplifier. Easy when you understand this! So the first thing to do when using a stereo AUX port Bluetooth receiver is “tell” your amplifier to “listen” to the AUX port itself. Lets take a look at the actual receiver. A standard jack is supplied which connects into the receiver. The other end goes into the AUX port on your stereo. Once you have selected the auxiliary port as the source of input, the system will listen out for signals coming from the port instead of (for example) your cd player. 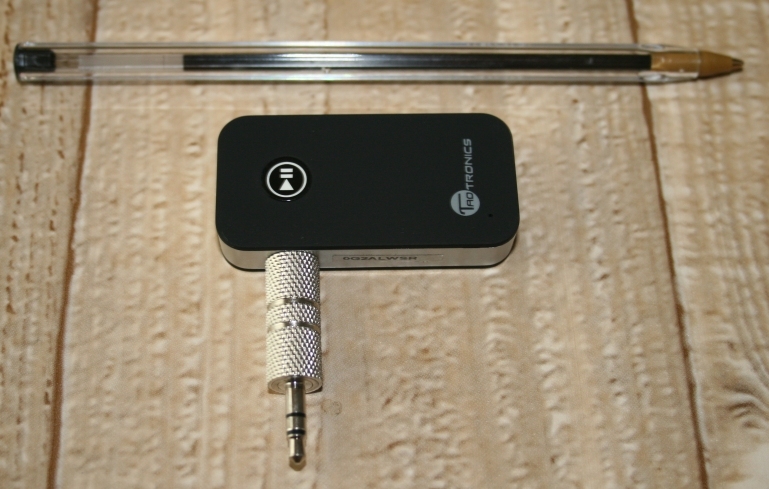 Pairing the Bluetooth receiver connected to your AUX port, with your phone or tablet. This is a simple process whereby you go into the settings and select which bluetooth device you want to pair with. 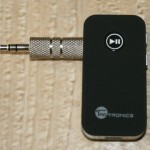 If the receiver is charged up (it has a built in battery – ouch) then it will appear in your list. Pair up and then start playing your music. If all goes well, your phone / tablet internal speaker will switch off and the sound will be transmitted to the stereo instead. This kind of device makes previously almost obsolete stereo equipment fully functional and brings it right up to date with modern technology, indeed it is true to say that bluetooth versions change quite often and people who fall into the marketing trap of spending hundreds of pounds for a new system with bluetooth compatibility already included may come unstuck as blue tooth moves on. Consider buying a new stereo with bluetooth version 1. Then consider buying a phone which no longer sends bluetooth 1 protocol? You are shafted. However by spending very little money on an adapter, you will escape this potential trap and only have to replace the adapter instead of your entire stereo – which like me – you may be more than content with despite its age. 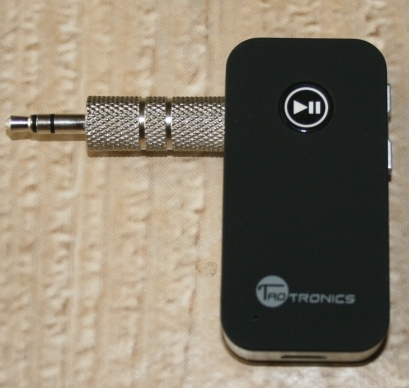 This particular device is provided by taotronics, a brand I have become to be increasingly impressed with over the last year or two having gone for their remote speakers. If you do a google search for their name, along with this item you will find the places they are currently selling them. Once again I find myself a tiny bit reluctant to give an item a full score because of the fact that it has a non-replaceable built in lithium battery – which is a shame because I would have thought making this with something replaceable but still rechargeable would be relatively simple, and I would pay a little more if need be. Having said this, overall, a fantastic idea and a great product.